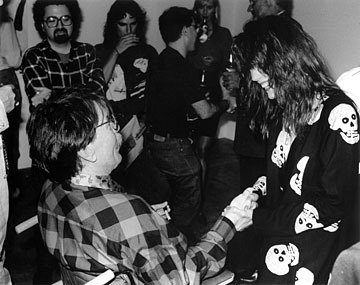 This photograph of Don Van Vliet meeting his old friend Pamela des Barres was taken at what must have been one of Don’s last public appearances. The occasion was the opening of Don’s exhibition at the Fred Hoffman Gallery, Santa Monica on 31 July 1990. There’s presently a unique chance to acquire a copy of this photograph, along with a catalogue from that exhibition, from the collection of Pamela des Barres herself. Pop over to eBay and read all about it. Pamela tells me that Victor Hayden, The Mascara Snake, is staying with her this week and will sign the catalogue for the winning bidder. If I was in the market for an “association copy” I’d ask for Pamela’s signature too!